Each painting created by the artist Walid Al Agha has multiple dimensions other than what might be suggested by its flat shape. This has been clearly manifested in his recent art show in Tajalliyat Art Gallery where he represented his paintings in geometrical shape with the top of it a pyramidal figure made with the same colors and textures of his paintings. This pyramidal representation is a new approach represented by Walid Al Agha whereby he is trying to make use of the pyramid’s energy, figure and situation which interacts in turn with the content and the internal meaning of the painting. 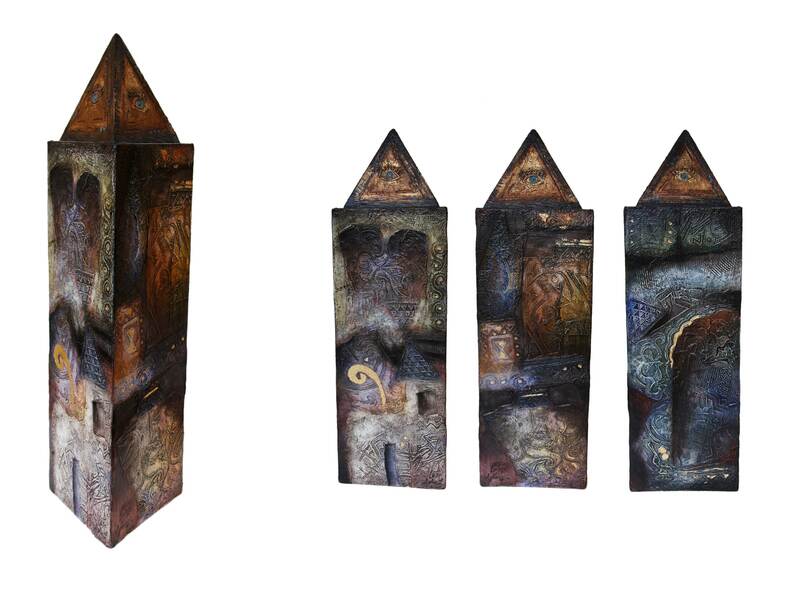 His paintings hold in its entity a cultural heritage and have the same energy of the pyramid and here he is intertwining the two energies to express what he feels away from the traditional structure. In reference to the pyramids we can see that the triangle was one of the most alluring shapes that are present in his paintings and this is because of the deep significance it carries, and hence the pyramid is a continual intense manifestation for this significance. In general we can say that Agha’s works are visually and structurally diverse and miscellaneous as a reflection of the artist’s spiritual and aspiring situation that he lives and manifests in his paintings. The common noticeable element in all his paintings is still the same, the Syrian folklore represented in color, word, shape and passion with an extra portion of the private and the personal.